Following its facelift, and a revamped menu of new and finessed favourites by Executive Chef Cheung Siu Kong, Cantonese restaurant Summer Pavilion at The Ritz-Carlton Millenia Singapore has been awarded One Michelin Star for three consecutive years by the Michelin Guide Singapore—and probably one of the most well-deserved in their star tier category. What I've noticed, and also confirmed by the team, is that chef keeps the base design of his Yusheng constant (unless by special request), following a layout somewhat of butterfly, or an 8-propeller drone, likeness. 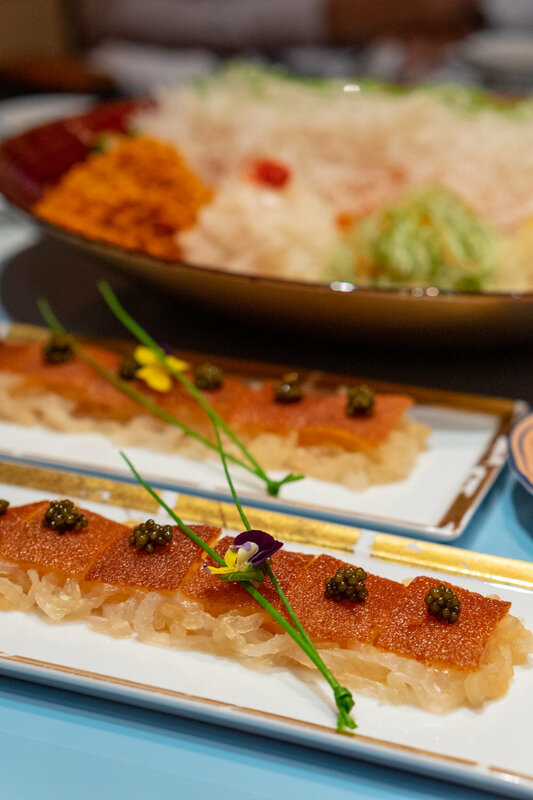 It is the accompanying luxe condiments that change. 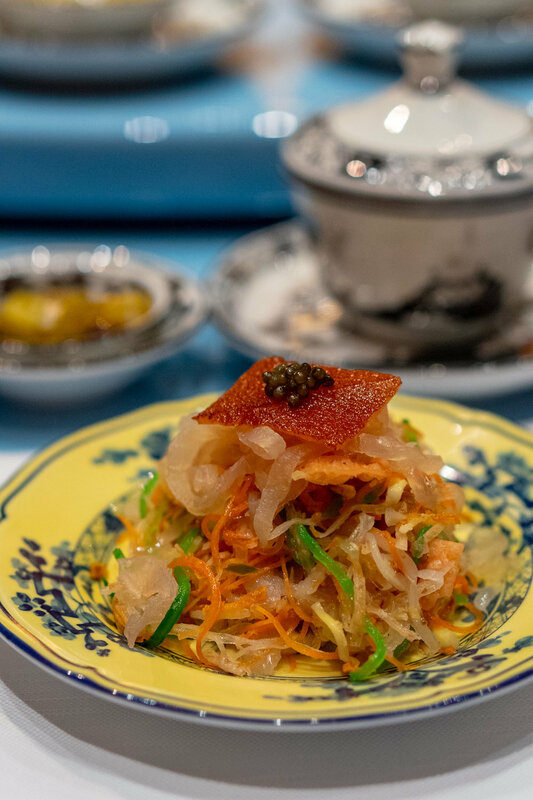 This year, the anticipated porcine twist comes in the form of impressive suckling pig, indulgently dotted with caviar, and strings of jellyfish for an intriguing springiness—aptly named the Suckling Pig, Black Caviar, Jelly Fish Yu Sheng (small $138; large $276 a la carte). These premium ingredients are also thoughtfully added to your plate only after the tossing is complete, so you don't lose it in the chaos. 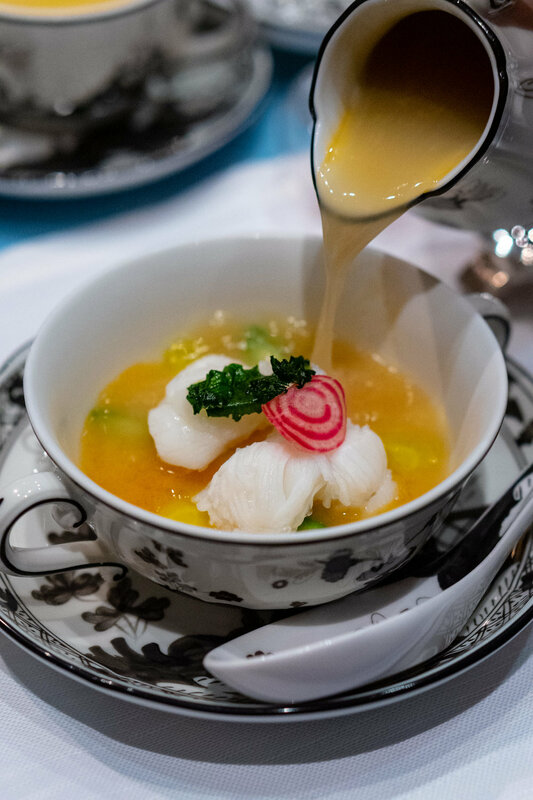 The Australian Lobster Soup, Asparagus, Carrot, Egg White, Lobster Stock is easily the unanimous favourite that evening. Chunks of lobster swim in a riveting soup, rich and full of flavour, with a delicate egg white custard seabed to accentuate the natural fresh seafood sweetness. 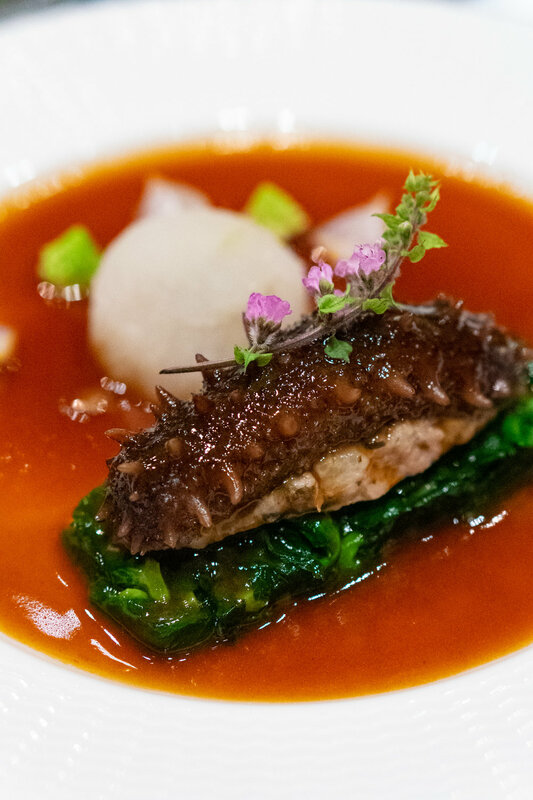 Chef spotlights Iberico pork in two more dishes on the tasting menu we previewed. 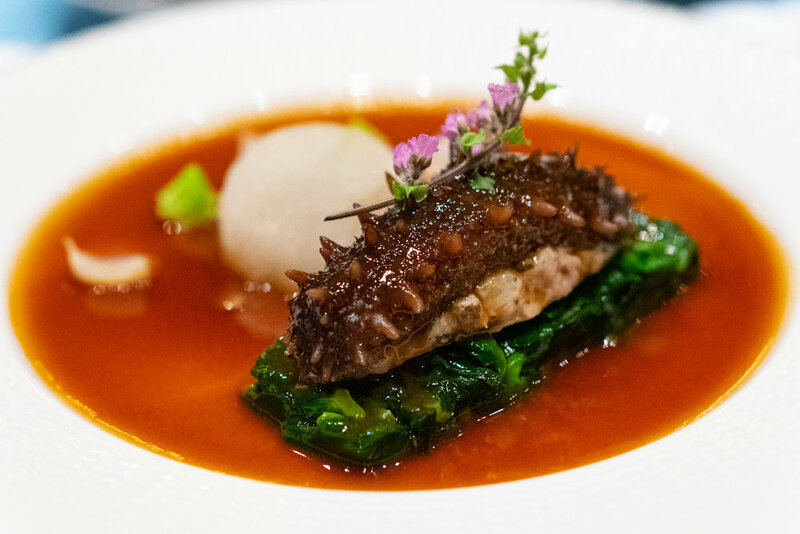 The faultless, and also stunning, Stuffed Prickly Sea Cucumber bore a lusciously textured pork stuffing, and a masterfully carved winter melon filled with mushrooms. Then there’s the Poached Iberico Pork Rice Dumpling, Cabbage in Superior Stock, a reinterpreted dish from chef’s childhood. 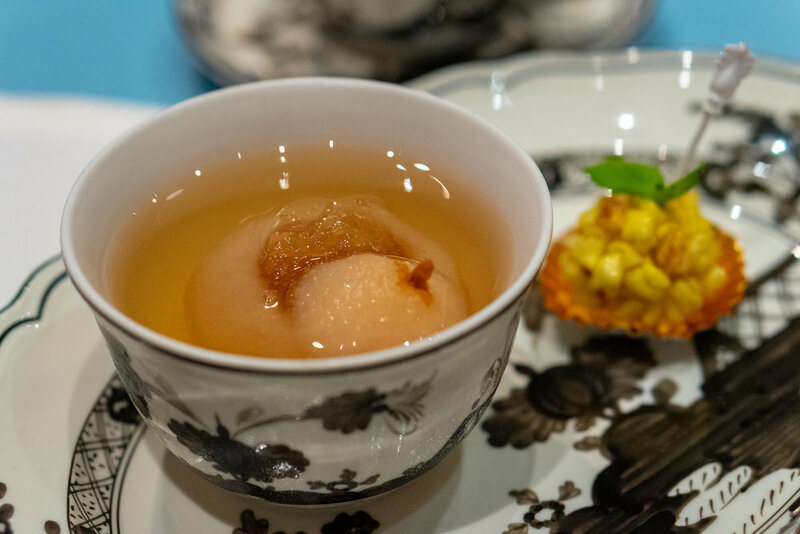 Looks simple, but this amazingly savoury version is a different personality from our usual Tang Yuan. 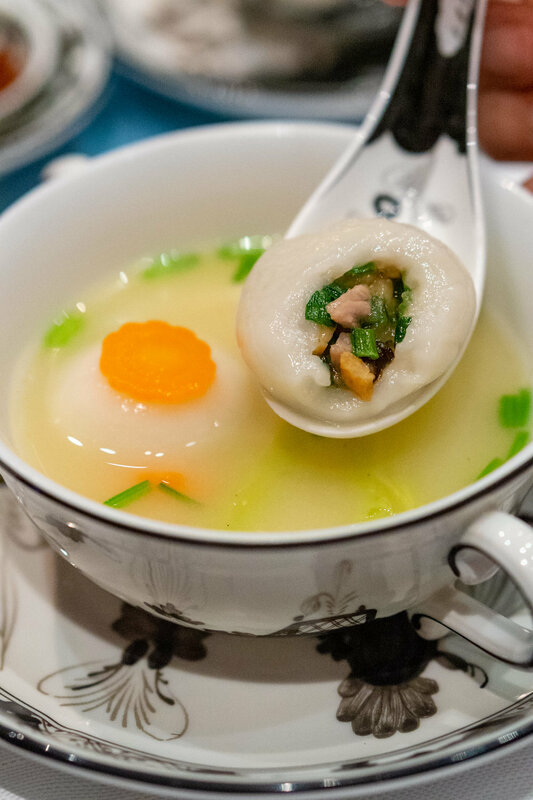 The skin has a certain bite to it, almost like mochi-like, with a tasty pork and chive filling, and the soup—oh, the soup—is just ripples of warmth and comfort. If you’re already here for a Chinese New Year meal, why not carry on and pamper yourself with the Chilled Superior Bird’s Nest & Pear with Osmanthus Crunch Bar. Despite being stuffed, we made brisk work of the dessert—practically slurping up every bit of this refreshing extravagance. 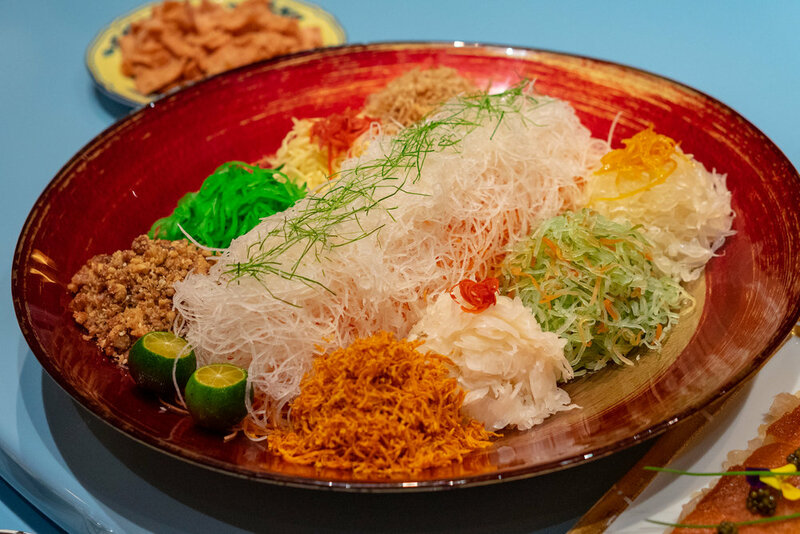 Chinese New Year dining at Summer Pavilion is available through 19 February 2019. Visit their website for more details and information, or click HERE for their CNY menu.